When you want to make sure that there are no surprises to your wallet, this plan covers everything in the Essential Care Monthly Maintenance Plan PLUS no-charge internal replacement parts in case of equipment failure (up to $500 per year) PLUS no-charge wireless networking setup and maintenance and Internet router maintenance. For the one annual fee, this plan will keep your computer running at peak performance all year round. First, we will perform an initial tune-up of your system to make sure that every is working at peak efficiency. We’ll update your software, install software to backup all of your information, install our anti-malware protective suite (including a 1-year paid anti-virus subscription) and also install our remote support software which will allow us to assist you without your computer ever leaving your house/office. After that, every month for the entire year, for no additional cost, we will remotely checkout the Windows OS and remove any malicious software, unwanted programs and generally make sure that Windows is working correctly, is up to date and has all of the protective software installed and operating properly. 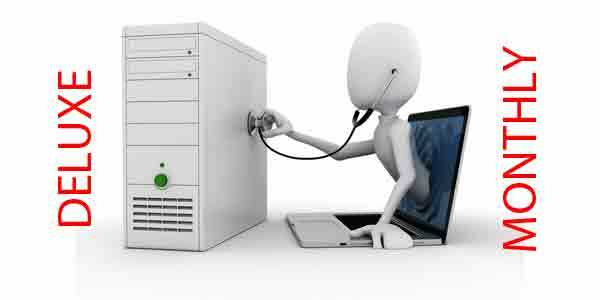 We’ll also check your computer backup system to verify that it is operating properly and protecting your information as well as possible. Additionally, we’ll check your router configuration and make any necessary adjustments to make sure that your Internet connection is secure from intrusion and operating properly. On-Site service is available for covered services, when necessary, at 50% off of our normal hourly rates. Also, this service requires that your computer be able to connect over the Internet, that you have a high speed Internet connection and that you have an external backup hard drive capable of backing up your entire internal hard drive. If you don’t have a suitable backup hard drive, we can provide one to you at an additional charge.